Imagine yourself cascading down a warm crystal bluegreen river as you gaze in wonder at the many exotic creatures living in the surrounding jungle. 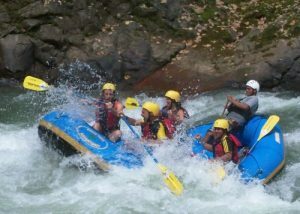 Simply stated, Costa Rica is home to some of the best white water rafting in the world! 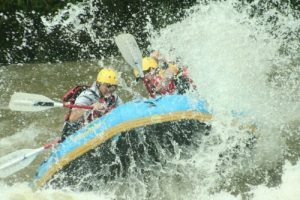 From the mellow class II rapids of the Pejivalle to the big water class V on the Reventazon river, Whitewater Rafting In Costa Rica will leave you breathless. The Pacuare River is the undisputed crown jewel of all the Costa Rican Rivers. National Geographic called the Pacuare one of the top two rafting rivers in the world. On its way to the Caribbean Sea, the Pacuare plunges through some of Central America’s last untouched tropical rain forest. In between the class III and IV rapids you’ll gaze in wonder at the primordial forest and its wild inhabitants. The Pacuare River Gorge is home to thousands of exotic creatures such as sloth, monkeys, toucans, and the elusive jaguar. This lush paradise is accentuated by literally dozens of spectacular waterfalls crashing down hundreds of feet into the blue-green waters of the Pacuare. 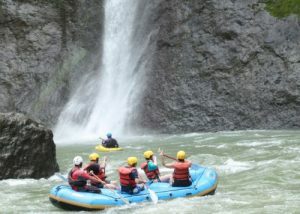 The Pacuare is invariably the highlight of our client’s vacation in Costa Rica. starting to get into paddle rafting as there is no stress from the big whitewater and the access road is always less then 100 yards away. from Puerto Limon to San Jose paralleled the river and fragments can still be seen along the banks. The Sarapiqui River offers some similarities as its brothers to the south (the Reventazon and the Pacuare), enough whitewater to get your heart pumping and the scenery breathtaking between the rapids. 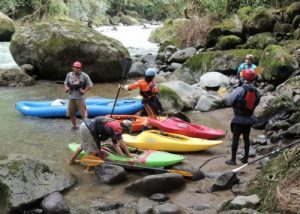 There are three runs that are commonly done on the Sarapiqui River giving a choice between easy, medium and hard. The Chilamate run is class I and II and is perfect for families with younger children, or who are more interested in watching wildlife then whitewater. The Lower Sarapiqui section is class III and IV is a good c ompromise of challenging water and wonderful views and is suitable for strong, but inexperienced rafters. The Upper Sarapiqui boasts class IV and V rapids for seven miles and is perfect whitewater for experienced paddlers looking for a major adrenaline rush.